Sopwith Snipe of No 208 Squadron (1918). Introduced into service during the closing stages of World War I, the Sopwith Snipe remained as the RAF's first major post-war fighter, serving with a total of 20 squadrons. 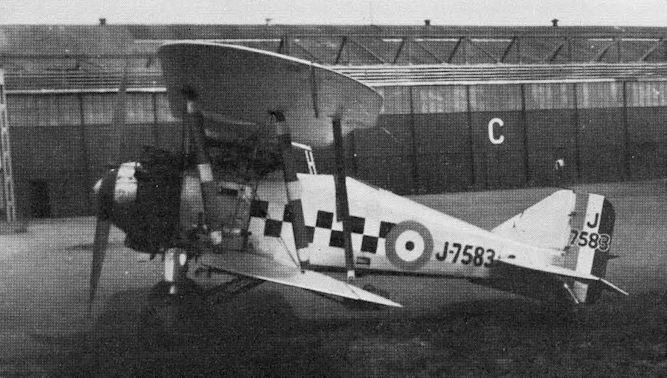 Bristol Bulldog IIA of No 3 Squadron (1934). 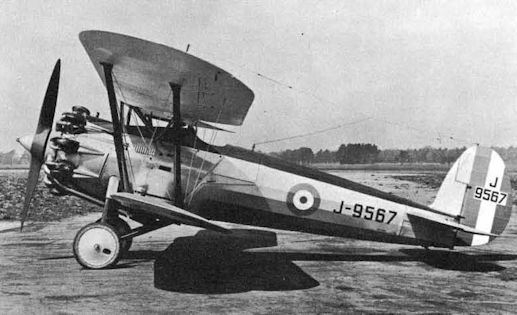 The Bristol Bulldog IIA equipped six squadrons, mostly in succession to the Gamecock, but remained firmly cast in the mould of the British fighters of the ’twenties. Armstrong Whitworth Sis­kin IIIA of No 43 Squadron (1929). The Armstrong Whitworth Siskin IIIA replaced the Grebe in many squadrons, serving with a total of 11 RAF units. With its uncowled radial engine and twin 0 303-in machine gun armament it was entirely typical of the 'twenties. Gloster Gladiator II of No 25 Squadron (1939). 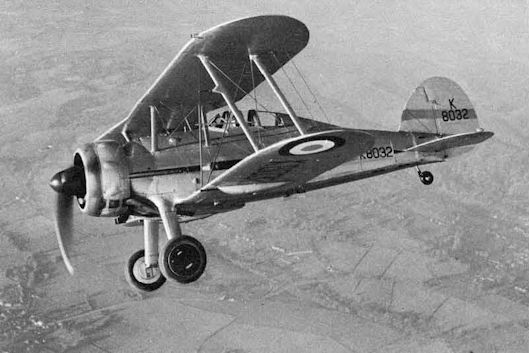 Last of the RAF’s biplane fighters, the Gloster Gladiator was flown, at various times, by no fewer than 36 squadrons, but by the time it entered service it had already been outmoded by the new monoplanes that were under development. Hawker Fury I of No 1 Squadron (1933). The elegant Hawker Fury was one of the large family of biplanes originated on Sydney Canon's drawing boards in the inter-war periods. Seven RAF squadrons flew Furies, including No 25, illustrated performing a "tied-together" display. 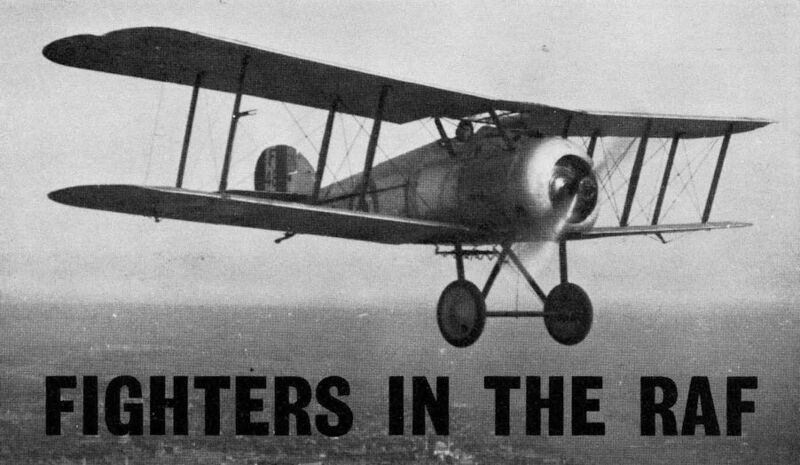 The Gloster Gauntlet was one of nine types of fighter biplane ordered into production for the RAF between 1918 and 1938, each representing only a small advance in performance over its predecessor. 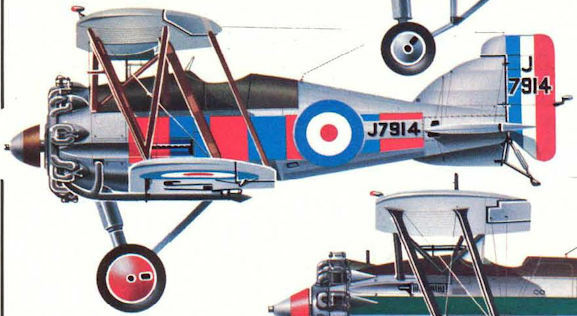 Illustrated are the Gauntlets of No 46 Squadron; another 21 squadrons flew the type. The first significant fighter to enter service after the end of the war was the Gloster Grebe, shown here in the markings of No 56 Squadron. The Grebe was the first of a series of Gloster fighters which were in service with the RAF almost without interruption from 1923 to 1967. 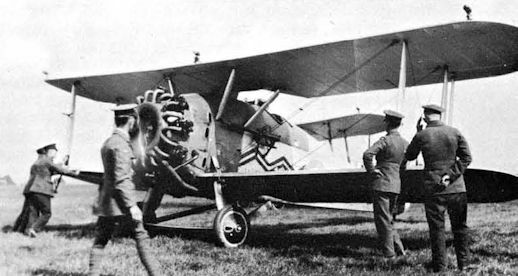 Gloster Gamecock I of No 23 Squadron (1929). Gloster’s successor for the Grebe, evolved to an official specification in the mid-twenties, was the Gamecock, illustrated here in the markings of No 56 Squadron (No 43 Sqdn. ???). Only seven squadrons were equipped with Gamecocks.